An online advertising partnership between Yahoo and Google is facing opposition from consumer and civic groups that did not wait for an official deal announcement to voice their discontent. Top Google executives said they were interested in a partnership with their closest rival but didn’t indicate how close they were to an agreement. A coalition of 16 civil rights and rural advocacy groups, including the Black Leadership Forum and the League of Rural Voters, urged federal regulators to investigate the potential combination. The Black Leadership Forum is an umbrella group of 36 civil rights organizations, including the NAACP and the National Urban League. The groups argued in a letter to Assistant Attorney General Thomas Barnett, head of the Justice Department’s anti-trust division, that the deal would give Google almost 90 per cent of the search advertising market and strengthen its influence over Internet users’ access to information. Separately, the Centre for Digital Democracy (CDD), a consumer advocacy group, said it will push US regulators to block any deal and is already urging European consumer groups to raise concerns with European Union officials. The EU generally takes a tougher approach on anti-trust, fining Microsoft $1.3 billion for anti-competitive conduct earlier this year. “You can’t allow Google to operate a portion of its leading competitor out of its back pocket,” said CDD executive director Jeffrey Chester. While previous attempts to block deals by both the CDD and civil rights organisations have proved unsuccessful, their opposition won’t be the only hurdle to a Google-Yahoo partnership. The Justice Department has already made inquiries about an ad partnership test the two had for two weeks last month. And, Sen. Herb Kohl, who chairs a subcommittee overseeing anti-trust issues, said last month he would closely scrutinize any permanent deal. 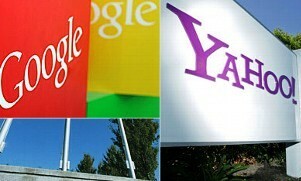 The civil rights groups noted in their letter to Barnett that Google has about 70pc of the search advertising market, and Yahoo 20pc.